You are currently viewing an earlier version of this article (April 06, 2018). Several new treatment modalities with different mechanisms of action have been studied in patients with Behçet’s syndrome (BS). The aim of the current effort was to update the recommendations in the light of these new data under the auspices of the European League Against Rheumatism (EULAR) Standing Committee for Clinical Affairs. A task force was formed that included BS experts from different specialties including internal medicine, rheumatology, ophthalmology, dermatology, neurology, gastroenterology, oral health medicine and vascular surgery, along with a methodologist, a health professional, two patients and two fellows in charge of the systematic literature search. Research questions were determined using a Delphi approach. EULAR standardised operating procedures was used as the framework. Results of the systematic literature review were presented to the task force during a meeting. The former recommendations were modified or new recommendations were formed after thorough discussions followed by voting. The recommendations on the medical management of mucocutaneous, joint, eye, vascular, neurological and gastrointestinal involvement of BS were modified; five overarching principles and a new recommendation about the surgical management of vascular involvement were added. These updated, evidence-based recommendations are intended to help physicians caring for patients with BS. They also attempt to highlight the shortcomings of the available clinical research with the aim of proposing an agenda for further research priorities. Behçet’s syndrome (BS) is a systemic variable vessel vasculitis that involves the skin, mucosa, joints, eyes, arteries, veins, nervous system and the gastrointestinal system. Physicians from several different disciplines are involved in the care of patients with BS. The disease shows geographic differences in its clinical features. Thus a multicentre collaboration of experts from different specialties and from different parts of the world is necessary for the optimisation of the recommendations for managing BS. The first European League Against Rheumatism (EULAR) Recommendations for the management of Behçet’s disease that were published in 2008 has gained a lot of interest and helped physicians from different disciplines in the management of patients with BS.1 At that time a total of nine recommendations were formed after a literature review, a Delphi exercise and two expert consensus meetings by a task force that included rheumatologists, ophthalmologists, dermatologists, a neurologist and a patient. In five of the nine recommendations, the strength of the recommendation was ‘D’, indicating that it was based only on expert opinion for the whole or at least a part of the recommendation. The task force felt that there was a need for updating these recommendations as there had been several related new publications and data with new agents were available. Especially the experience with the use of biological agents in BS has substantially increased during the recent years. There is also more evidence to guide us in the management of gastrointestinal involvement and about other issues such as the use of anticoagulants in BS patients with vascular involvement. One of the shortcomings of the previous recommendations was that it lacked guidance regarding the surgical and interventional treatment options for vascular involvement. The objective of the current project was to update and improve the EULAR Recommendations for the management of BS in the light of the new studies, in addition to identifying the hitherto uncovered areas for future research. The target population for these recommendations includes all physicians and surgeons who are involved in the treatment of BS. The standard operating procedures for developing EULAR-endorsed recommendations was followed and when applicable the Appraisal of Guidelines, Research and Evaluation instrument was used.2 A task force was formed including 20 BS experts from seven European countries and Korea, 1 healthcare professional (a nurse), 2 patients with BS, 2 fellows responsible for the systematic literature review who are EMEUNET members and 1 senior methodologist. The experts were from various specialties that are involved in the management of patients with BS including internal medicine, rheumatology, ophthalmology, dermatology, neurology, gastroenterology, oral health medicine and vascular surgery. An initial Delphi was conducted among the task force members to identify the questions and problem areas which were not covered by the previous recommendations and areas that need updating. A total of 52 clinical questions were decided on with input from both physician and patient members of the task force. The questions were amalgamated and formulated into Population, Intervention, Comparison and Outcome questions for the systematic review.3 A protocol was prepared for the systematic review according to the recommendations given in Preferred Reporting Items for Systematic Reviews and Meta-Analyses Protocols and registered in International Prospective Register of Systematic Reviews before starting the systematic literature search (registration number CRD42015027033). The systematic literature search was conducted by two fellows independently and disagreements were resolved by the convenor. Systematic reviews for mucocutaneous and joint involvement and for major organ involvement including eye, vascular, nervous system and gastrointestinal system involvement are prepared in detail for publication separately (Ozguler et al. 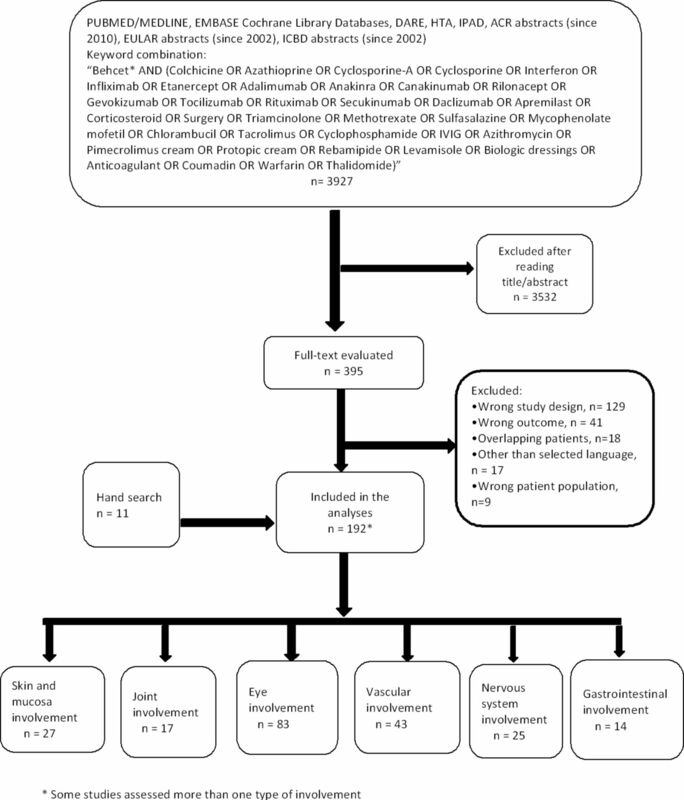 Management of Major Organ Involvement of Behçet’s Disease: Systematic Literature Review for the Update of the EULAR Recommendations for the Management of Behçet’s Syndrome, submitted for publication; Pietro et al. Management of Skin, Mucosa and Joint Involvement of Behçet’s Syndrome: A Systematic Literature Review for Update of the EULAR Recommendations for the Management of Behçet’s Syndrome, submitted for publication). These systematic reviews and the recommendations manuscript form an integral and inseparable sum and should be read as such. MEDLINE (from 1950), EMBASE (from 1980), The Cochrane Library, including the Cochrane Central Register of Controlled Trials, Cochrane Database of Systematic Reviews, Database of Abstracts of Reviews of Effects and Health Technology Assessments, International Pharmaceutical Abstracts Database and the http://www.ClinicalTrials.gov website were searched using the predefined keywords and keyword combinations. Any randomised controlled trial (RCT), controlled clinical trial whether open label or not comparing an active intervention (alone or in combination) in patients with BS with any other comparator (drug or placebo) were included. If controlled trials were not available for answering a specific research question, uncontrolled evidence from preferably prospective cohort studies or case series was considered. Studies including patients meeting any of the criteria sets for BS or with a given diagnosis of BS as described by the authors were considered eligible. Authors and/or sponsors were contacted when additional data were required. This ‘Oxford system’ was used for designating the level of evidence and strength of recommendation as advised by the standard operating procedures for developing EULAR-endorsed recommendations.2 Consensus was reached explicitly via voting with the prespecified decision to include only the statements that obtain agreement by at least 70% of the experts. Additionally, the level of agreement from 0 to 10 for each recommendation was determined by a closed vote. The systematic search of the literature databases yielded 3927 articles. After reviewing the title and abstracts, 395 were selected for full-text evaluation and 11 additional articles were identified through hand search. Finally, 192 studies on the management of mucocutaneous, joint, eye, vascular, nervous system and gastrointestinal system involvement of BS were included (figure 1). The detailed methods and results of the systematic reviews for mucocutaneous and joint involvement and for major organ involvement are submitted separately. Based on the results of these systematic reviews and experts’ opinions, 5 overarching principles and 10 recommendations (table 1) were formed. Flow chart of the study selection process. ACR, American College of Rheumatology; DARE, Database of Abstracts of Reviews of Effects; EULAR, European League Against Rheumatism; HTA, Health Technology Assessments; ICBD, The International Criteria for Behçet’s Disease; IPAD, International Pharmaceutical Abstracts Database. BS is a condition that typically runs a relapsing and remitting course, and the goal of treatment is to promptly suppress inflammatory exacerbations and recurrences to prevent irreversible organ damage. A multidisciplinary approach is necessary for optimal care. Treatment should be individualised according to age, gender, type and severity of organ involvement and patients’ preferences. Ocular, vascular, neurological and gastrointestinal involvement may be associated with a poor prognosis. Disease manifestations may ameliorate over time in many patients. Several RCTs explored the efficacy of different immunomodulatory and immunosuppressive agents for mucocutaneous lesions. Colchicine was shown to be effective for genital ulcers and nodular lesions especially in women, but there was some controversy regarding its efficacy in oral ulcers.6–8 The efficacy of colchicine and immunosuppressives for papulopustular or acne-like lesions seems to be limited. Mild forms of papulopustular or acne-like lesions are treated first by topical measures as used in acne vulgaris. However, chronic recurrent lesions or severe forms mimicking acne conglobata or acne cystica require systemic measures such as retinoids, sometimes together with surgical and physical therapy. Considering the safety and good tolerability of colchicine, the group agreed that it should be tried first in patients who have only mucocutaneous involvement. In patients who present with an acute exacerbation of mucocutaneous lesions, topical corticosteroids may help the rapid healing of these lesions. For patients whose lesions continue to recur despite colchicine, immunomodulatory or immunosuppressive drugs such as azathioprine, thalidomide, interferon-alpha, tumour necrosis factor alpha inhibitors (TNFis) or apremilast can be used.9–13 The choice of immunomodulatory or immunosuppressive drug in such patients would depend on individual patient characteristics regarding safety, the cost and availability of these agents in each country, and patient preferences. Uncontrolled observational evidence suggests that lactobacilli lozenges may be a safe alternative.14 Dapsone and azithromycin have also been tried with beneficial results.15 16 Among the newer biological agents, interleukin (IL)-1 blockade with anakinra and canakinumab seems to provide a partial benefit in BS patients with mucocutaneous involvement, whereas IL-17 blockade with secukinumab was ineffective and IL-6 blockade with tocilizumab worsened mucocutaneous lesions.17–22 A very recent manuscript published after the preparation of these recommendations suggests that ustekinumab may also be beneficial.23 Management should be planned according to patients’ preferences, depending on the burden of their mucocutaneous lesions weighed against the risk of adverse drug reactions with these agents. The management of leg ulcers may be problematic since it is associated with venous stasis caused by deep vein thrombosis and/or obliterative vasculitis causing acute and chronic arterial ischaemia. Leg ulcers may occasionally be associated with pyoderma gangrenosum and require immunosuppressives. The systematic review showed no studies guiding the management of leg ulcers, thus this part of the recommendation was based solely on expert opinion. For each patient, treatment should be planned with a dermatologist and vascular surgeon experienced with such lesions as these may require the use of immunosuppressives, antibiotics if infection is present, debridement or occlusive measures such as the use of compression bandaging. Management of uveitis requires great caution with early recognition and evaluation of the severity of the involvement and frequent monitoring of drug response in order to prevent damage causing a permanent decrease in visual acuity and eventual blindness. Close collaboration with an expert ophthalmologist is essential. Systemic, high-dose glucocorticoids are used for rapid suppression of inflammation during acute attacks. However, glucocorticoids should never be used alone in patients with posterior uveitis. Systemic immunosuppressives such as azathioprine, cyclosporine-A, interferon-alpha, infliximab or adalimumab should be used in such patients. RCTs have shown the efficacy of azathioprine and cyclosporine-A in preserving visual acuity and preventing relapses in patients with uveitis.9 24–26 However, there are no RCTs to guide the management of patients who are refractory to these agents. Some experts have preferred interferon-alpha and others preferred monoclonal anti-TNF antibodies for such patients. A review of the literature for open-label, observational studies or retrospective case series with these agents hinted at certain differences such as a rapid response and improvement in visual acuity with infliximab, a sustained response with interferon-alpha as well as high remission rates with both of these agents.27–63 The choice of treatment would depend on patient factors such as risk of infections including tuberculosis with monoclonal anti-TNF antibodies and tolerability of interferon-alpha, physician’s experience with these agents and reimbursement policies of each country. Other biological agents such as IL-1 and IL-17 blockers have also been tried. The IL-1 blocker gevokizumab71 and IL-17 blocker secukinumab20 failed to meet their primary endpoints in RCTs. Intravitreal glucocorticoid injections can be used in patients with an acute exacerbation in one eye.72–76 However, this should be used only as an adjunct to systemic immunosuppressive therapy. Vitrectomy should only be used in patients with complications such as vitreous condensation, coagulated vitreous haemorrhage, tractional retinal detachment, vitreoretinal or epiretinal membranes. There is no anti-inflammatory effect of this procedure in patients with uveitis. Isolated anterior uveitis in patients with BS may be treated with topical agents. However, some patients may have hypopyon uveitis, which is a severe form of anterior uveitis, and some patients with isolated anterior uveitis develop posterior uveitis over time. Although it is not easy to predict which patients are at risk, it was shown that young men with an early age at disease onset have a higher risk of more severe disease. A systemic immunosuppressive such as azathioprine may be considered in such patients with the anticipation that it may have a protective effect. However, there are no data yet that show such an effect. We performed a meta-analysis of the three retrospective studies that reported on the efficacy of immunosuppressives and/or anticoagulants for preventing recurrences of deep vein thrombosis in patients with BS.78–80 A pooled estimate of the relapse risk of deep vein thrombosis in patients with BS treated with immunosuppressives and anticoagulants compared with those treated with only anticoagulants favoured the use of immunosuppressives with an relative risk (RR) of 0.17 (95% CI 0.08 to 0.35). On the other hand, treatment with anticoagulants and immunosuppressives compared with immunosuppressives alone did not provide a significant benefit in preventing relapses (RR 0.75, 95% CI 0.48 to 1.17). There were no data to mandate the preference of one immunosuppressive agent over the others. Azathioprine, cyclophosphamide or cyclosporine-A are agents that can be preferred in such patients. Cyclophosphamide may be reserved for patients with extensive thrombosis of larger veins such as vena cava due to its potential adverse events. There were no data to guide the management of patients with refractory venous thrombosis. Monoclonal anti-TNF antibodies may be used since beneficial results have been obtained in BS patients with refractory arterial involvement. Interferon-alpha may be tried in selected cases. Although our meta-analysis indicated that adding anticoagulants to immunosuppressives did not decrease the relapse risk, there is a retrospective study suggesting that not using anticoagulants may increase the risk of post-thrombotic syndrome (OR 3.8, 95% CI 1.04 to 14.1).81 The task force felt that no recommendation against anticoagulant use can be made because of the lack of prospective controlled trial data demonstrating that anticoagulants do not decrease the relapse risk and the frequency of post-thrombotic syndrome in patients with BS. Peripheral artery aneurysms require emergency surgery or stenting unless they are small, asymptomatic and carry a low risk of rupture. Medical treatment with high-dose corticosteroids and cyclophosphamide may be sufficient for such small aneurysms. Observational studies show that medical treatment is necessary in addition to surgery or stenting in order to decrease the risk of postoperative complications and recurrences.88–90 Medical treatment should ideally start before an aneurysm repair is attempted. For both pulmonary and peripheral artery aneurysms, the choice of surgical intervention between graft insertion, ligation and bypass surgery can be made according to the size and location of the aneurysm and the surgeon’s experience. Synthetic grafts should be preferred since venous grafts have a higher risk of thrombosis in patients with BS. One of the most challenging issues regarding gastrointestinal involvement is to diagnose it correctly since abdominal pain, diarrhoea and intestinal ulcers may commonly be related to other reasons such as non-steroidal anti-inflammatory drug ulcers and gastrointestinal infections including tuberculosis, especially among patients receiving immunosuppressives.91 Confirming the diagnosis is essential to prevent the unnecessary use of immunosuppressives that may be especially harmful if the patient has an infection. The evidence available for the management of gastrointestinal involvement relies on retrospective observational data since there are no controlled trials for this relatively uncommon type of involvement.91 The choice of the initial treatment modality depends on the severity of gastrointestinal involvement. Glucocorticoids are thought to help the rapid healing of ulcers during acute exacerbations. There is some concern about the potential of high-dose glucocorticoids to facilitate perforation in patients who already carry a high risk of perforation; however, there are no data to show this. Milder gastrointestinal involvement may be treated with 5-aminosalicylate derivatives whereas more severe cases can be treated with azathioprine.91–93 Retrospective data showed that infliximab, adalimumab and thalidomide may be beneficial in patients with severe involvement, refractory to azathioprine.94–99 Infliximab and thalidomide may be used concomitantly in selected cases. A cohort study of BS patients with gastrointestinal involvement showed that almost a third of these patients required emergency surgery due to perforation, major bleeding or obstruction.91 Timely recognition of these complications is very important since they may be fatal if left untreated. Immunosuppressives seem to decrease the risk of postoperative recurrences and complications in such patients. The two types of central nervous system involvement, namely parenchymal involvement and cerebral venous thrombosis, rarely occur in the same patient. Cerebral venous thrombosis usually manifests as an extension of vascular involvement in BS. This obviates the need of screening for early and occult vascular lesions in patients diagnosed with cerebral venous thrombosis. There are differences in the management of these two types of nervous system involvement, and the recommendations for both are supported by only uncontrolled observational studies. The task force members agreed that an acute cerebral venous thrombosis episode should be treated with high-dose glucocorticoids to obtain a rapid remission. However, there are no data showing the benefit of adding immunosuppressives in the first episode of cerebral venous thrombosis and the group felt that this may not be necessary since relapses are not frequent in this type of involvement. Anticoagulants may be added for a short duration, especially in patients who have an additional prothrombotic condition. A meta-analysis of observational studies with cyclosporine-A showed an increased risk of nervous system involvement in patients using this agent (RR 12.66, 95% CI 4.75 to 33.76).105–108 Thus the task force recommended to avoid cyclosporine-A in BS patients with nervous system involvement, even if the nervous system involvement is no longer active. Colchicine was shown to be beneficial for preventing arthritis episodes in RCTs.6–8 Some members of the task force favoured the use of continuous low-dose corticosteroids in patients whose arthritis is not controlled with colchicine whereas others preferred azathioprine, interferon-alpha or TNFis.9 29 34 41 63 96 109–111 Intra-articular glucocorticoids may be helpful during an acute monoarticular attack. However, this may not be necessary in many cases since the arthritis episodes are usually self-limiting and disappear in 2–3 weeks. EULAR Recommendations for the management of BS were updated by notably revising the 2008 Recommendations and adding five overarching principles and one recommendation regarding the surgical management of arterial aneurysms. We also changed the title of the project to ‘EULAR Recommendations for the Management of Behçet’s Syndrome’. Some experts felt a designation of ‘syndrome’ was more accurate for Behçet’s, actually a constellation of symptoms. The presence of geographic differences in disease expression, symptom clusters some of which are more frequent in familial cases and differences in drug response between different types of organ involvement especially with different cytokine inhibitors support this contention.112 There was a discussion among the authors, and the disagreeing colleagues suggested that these considerations are also true for several complex and multifactorial diseases such as systemic lupus erythematosus, systemic sclerosis or antineutrophil cytoplasmic autoantibodies-associated vasculitis, none of which is called a ‘syndrome’. A separate online vote was held among the authors. In total, 10/23 members preferred ‘syndrome’, 7/23 preferred ‘disease’ and 6/23 voted ‘neutral’. It was also commented that this issue needed to be further discussed among a larger group of experts. Recommendations are especially important for conditions that require the collaboration of different specialties for management. The current recommendations aim to standardise the care of patients with BS; however, there will inevitably be differences in management across countries depending on the geographic variation of the disease, differences in healthcare systems, cultural differences leading to differences in the expectations and preferences of patients and reimbursement policies. Some examples of such differences are related to the dose and duration of glucocorticoid use, more frequent use of biologics in some centres, preference of interferon-alpha instead of TNFis, anticoagulation in patients with deep vein thrombosis and the type of surgical intervention used for arterial involvement. One of the strengths of the EULAR Recommendations for the management of BS is that the task force comprised experts from several countries and from all disciplines involved in the care of patients with BS allowing the incorporation of many perspectives regarding different aspects of the disease. Another strength was the involvement of two patients with BS who were actively involved in all stages including the selection of research questions for the systematic review. The task force tried to cover management issues in different settings and different types of patients. We anticipate that these recommendations would also be useful in parts of the world where BS is less prevalent and physicians rarely facing patients with this condition or a specific type of involvement of the condition. We also aimed to guide the physicians on the appropriate timing for referral to a specialist centre. Despite the continuous accrual of research data for BS management, the main limitation of these recommendations is that they were still relying on mostly observational and uncontrolled evidence and expert opinion for the treatment of vascular, gastrointestinal and nervous system involvement; as a consequence, strong recommendations were derived at by broadening the suggested management options. There were RCTs with several agents for mucocutaneous, joint and eye involvement, but very few were head-to-head trials. In potentially controversial cases any specific therapeutic option was only suggested conditionally. Moreover, the heterogeneity in study design, outcome measures and patient selection made it difficult to compare the efficacy of different agents. There is also a lack of studies evaluating the efficacy of different treatment strategies for BS such as a ‘step-up’ versus a ‘step-down’ approach. Another limitation of these recommendations is that we did not include economic considerations which can show important differences across countries. Finally, after completing the recommendations we listed the research questions that need to be answered in the future for improving the management of patients with BS and proposed a research agenda (table 2). In particular, further research is warranted for controversial issues such as the role of anticoagulation in patients with thrombosis and the comparative efficacy of interferon-alpha and TNFis in patients with eye involvement. In conclusion, we revised the EULAR Recommendations for the management of BS and developed 5 overarching principles and 10 recommendations related to the different types of organ and system involvement of BS. Implementation of these recommendations into clinical practice will be an important endeavour. The dissemination of the recommendations could be facilitated by translation into different languages and presentations in national meetings of different specialties involved in the management of patients with BS. This paper is dedicated to the memory of Ignazio Olivieri. The task force thanks EULAR for financial and logistic support. The Parker Institute, Bispebjerg and Frederiksberg Hospital (R. Christensen) is supported by a core grant from the Oak Foundation (OCAY-13-309).
. The long-term mortality and morbidity of Behçet syndrome: a 2-decade outcome survey of 387 patients followed at a dedicated center. Medicine 2003;82:60–76.
. A double blind study of colchicine in Behçet’s disease. Haematologica 1980;65:399–402.
. Thalidomide in the treatment of the mucocutaneous lesions of the Behçet syndrome. A randomized, double-blind, placebo-controlled trial. Ann Intern Med 1998;128:443–50.
. Interferon alfa-2a in the treatment of Behçet disease: a randomized placebo-controlled and double-blind study. Arch Dermatol 2002;138:467–71.
. Short-term trial of etanercept in Behçet’s disease: a double blind, placebo controlled study. J Rheumatol 2005;32:98–105.
. Lactobacilli lozenges in the management of oral ulcers of Behçet’s syndrome. Clin Exp Rheumatol 2006;24(5 Suppl 42):S83–6.
. Evaluation of conventional therapy versus cyclosporine A in Behçet’s syndrome. Transplant Proc 1988;20(3 Suppl 4):136–43.
. Double-masked trial of cyclosporin versus colchicine and long-term open study of cyclosporin in Behçet’s disease. Lancet 1989;1:1093–6.
. Human recombinant interferon-alpha2a (rhIFN alpha2a) for the treatment of Behçet’s disease with sight-threatening retinal vasculitis. Adv Exp Med Biol 2003;528:521–3.
. Efficacy, safety, and pharmacokinetics of multiple administration of infliximab in Behçet’s disease with refractory uveoretinitis. J Rheumatol 2004;31:1362–8.
. Longterm visual prognosis of patients with ocular adamantiades-Behçet’s disease treated with interferon-alpha-2a. J Rheumatol 2008;35:896–903.
. Long-term remission of ocular and extraocular manifestations in Behçet’s disease using infliximab. Clin Exp Rheumatol 2011;29(4 Suppl 67):S58–63.
. Adalimumab for treatment of severe Behçet’s uveitis: a retrospective long-term follow-up study. Clin Exp Rheumatol 2014;32(4 Suppl 84):S58–62.
. Major vessel thrombosis in Behçet’s disease: the dilemma of anticoagulant therapy - the approach of rheumatologists from different countries. Clin Exp Rheumatol 2012;30:735–40.
. Arterial lesions in Behçet’s disease. A study in 25 patients. J Rheumatol 1995;22:2103–13.
. TNF-alpha antagonists and thalidomide for the management of gastrointestinal Behçet’s syndrome refractory to the conventional treatment modalities: a case series and review of the literature. Clin Exp Rheumatol 2015;33(6 Suppl 94):S129–37.
. Treatment of NeuroBehcet’s disease with infliximab: an international multi-centre case-series of 18 patients. Clin Exp Rheumatol 2010;28(Suppl 60):S119.
. Central nervous system symptoms in a population of Behçet’s disease patients with refractory uveitis treated with cyclosporine A. Clin Exp Ophthalmol 2001;29:335–6.
. Cyclosporine for Behçet’s uveitis: is it associated with an increased risk of neurological involvement? Clin Exp Rheumatol 2008;26(4 Suppl 50):S84–90.
. Systemic interferon alpha 2b treatment in Behçet’s syndrome. J Rheumatol 1994;21:1098–100. Funding This project was funded by the European League Against Rheumatism. Competing interests BB received consultant fees from Santen, AbbVie, Allergan, Xoma and research grants from Novartis and Bayer. ITT received honoraria from Servier, AbbVie and Allergan. GH received research grants from Celgene, honoraria from Pfizer and speaker’s fees from Abbvie, MSD and UCB.